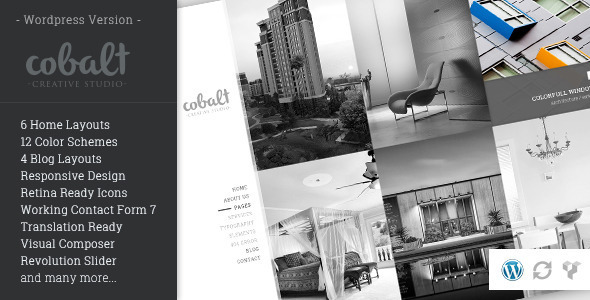 Cobalt is an Responsive WordPress Theme for Architects & Creatives, it has been designed specially in a minimal & simple design concept, to make it easier for the customers to navigate within your website. Cobalt is fully responsive and it has Retina Ready icons thanks to Font Awesome. It comes with a big options of Homepages, Blog Pages, About us Pages and other pages. WordPress Menu Support – un-limit levels of dropdown. With this Purchase you get FREE HTML Template | FREE PSD Files. Note: The images you see in the screenshots are used for demo purposes only, they are not included in the download package, the orignial ones are replaces with placeholders. 10/11/2014 V1.0.1 Fixed: Gmap contact form.